River corridors across the Sahara during the last interglacial? The last prolonged interglacial, the Eemian, was between 130,000 and about 110,000 years ago. It is during this period that some humans moved Out of Africa and into Arabia. 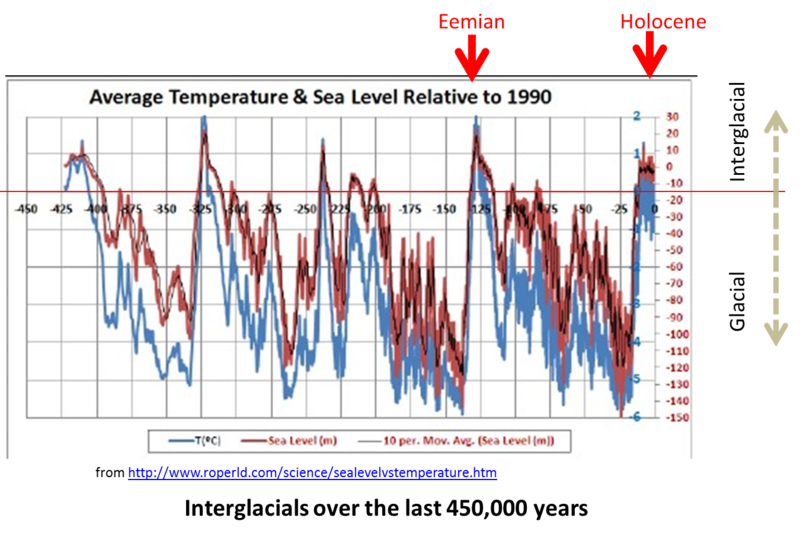 Temperatures during the Eemian gave a global average temperature around 20 – 25 °C (about 5 – 10 °C higher than today) with sea levels perhaps one metre higher than today. Around 100,000 years ago when the glacials were coming back and sea levels were down sharply, may well have been the time of the first wave of the big expansion of AMH out of Africa to Arabia and further East. This was later followed – probably – by a post-Toba expansion from Africarabia. But during the interglacial the Sahara was a desert and would have posed a barrier for movement into the North of Africa and especially the North East. How then did humans get from Southern and Central Africa to the North East of Africa? A new paper suggests that the Sahara of 125,000 years ago could have had green river corridors permitting such movement. Simulating paleoclimates in the region, the researchers found quantitative evidence of three major river systems that likely existed in North Africa 130,000-100,000 years ago, but are now largely buried by dune systems in the desert. When flowing, these rivers likely provided fertile habitats for animals and vegetation, creating ‘green corridors’ across the region. At least one river system is estimated to have been 100 km wide and largely perennial. The Irharhar river, westernmost of the three identified, may represent a likely route of human migration across the region. In addition to rivers, the researchers’ simulations predict massive lagoons and wetlands in northeast Libya, some of which span over 70,000-square kilometers. “It’s exciting to think that 100 000 years ago there were three huge rivers forcing their way across a 1000km of the Sahara desert to the Mediterranean — and that our ancestors could have walked alongside them” said Coulthard. Previous studies have shown that people travelled across the Saharan mountains toward more fertile Mediterranean regions, but when, where and how they did so is a subject of debate. Existing evidence supports the possibilities of a single trans-Saharan migration, many migrations along one route, or multiple migrations along several different routes. The existence of ‘green corridors’ that provided water and food resources were likely critical to these events, but their location and the amount of water they carried is not known. The simulations provided in this study aim to quantify the probability that these routes may have been viable for human migration across the region. Abstract: Human migration north through Africa is contentious. This paper uses a novel palaeohydrological and hydraulic modelling approach to test the hypothesis that under wetter climates c.100,000 years ago major river systems ran north across the Sahara to the Mediterranean, creating viable migration routes. We confirm that three of these now buried palaeo river systems could have been active at the key time of human migration across the Sahara. Unexpectedly, it is the most western of these three rivers, the Irharhar river, that represents the most likely route for human migration. The Irharhar river flows directly south to north, uniquely linking the mountain areas experiencing monsoon climates at these times to temperate Mediterranean environments where food and resources would have been abundant. The findings have major implications for our understanding of how humans migrated north through Africa, for the first time providing a quantitative perspective on the probabilities that these routes were viable for human habitation at these times. When flowing, these rivers likely provided fertile habitats for animals and vegetation, creating ‘green corridors’ across the region. At least one river system is estimated to have been 100 km wide and largely perennial. The Irharhar river, westernmost of the three identified, may represent a likely route of human migration across the region. In addition to rivers, the researchers’ simulations predict massive lagoons and wetlands in northeast Libya, some of which span over 70,000-square kilometers. “It’s exciting to think that 100,000 years ago there were three huge rivers forcing their way across a 1000km of the Sahara desert to the Mediterranean — and that our ancestors could have walked alongside them” said Coulthard. This entry was posted in AMH, Ancestors, Peopling the world and tagged Africa, Eemian, Human Migration, last interglacial, North Africa, Out of Africa, Out of Africarabia, river corridors, Sahara. Bookmark the permalink. 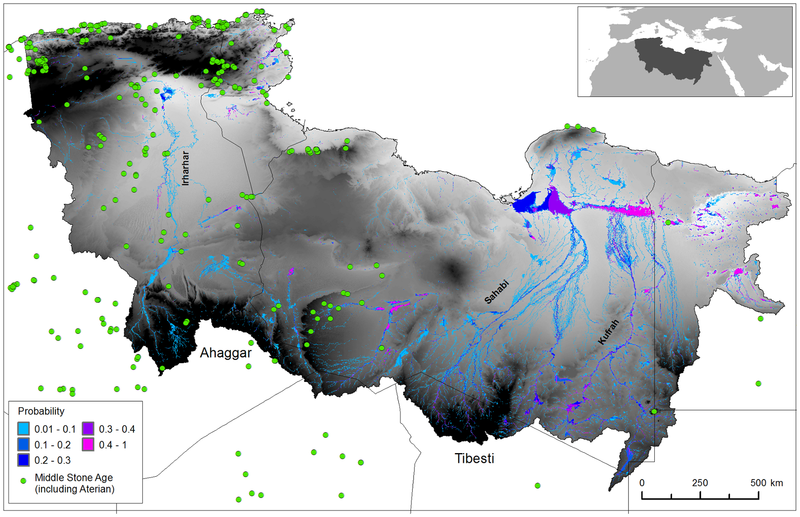 2 Responses to River corridors across the Sahara during the last interglacial?